Refurbished and bought back to life by the current owners, Trullo Stefano is a very special Italian home, set in an idyllic rural location 5 min drive from the historic town of Cisternino. It boasts a private setting surrounded by olive and fruit trees, with panoramic views of the countryside and Cisternino. It has a very spacious patio area with a large barbeque and shaded terrace for alfresco dining. The property has an open-plan living area which makes it very sociable and due to the nature of the building is always cool even during the hot summer months. Cisternino is one of the most beautiful towns in Puglia, even referred to as the "Jewel of Italy" and the "parked" Ferrari. The historic town is renowned for its many gourmet restaurants and interesting bars. The weekly Monday outdoor market is stocked with fresh locally produced fruit, vegetables and also wonderful selection of fish, meats and cheeses. Miles of unspoilt beaches only a 15 minute drive away. There is a swimming pool at Trullo Amico about 13 minutes drive from Trullo Stefano costing €5 per day each person in Contrada Barbagiulo. We are lovers of the relaxed Italian lifestyle and the very good food and wine of Puglia. After purchasing Trullo Stefano in 2004, we decided to buy Casa Caterina, so we could have the best of the countryside and the town. We love to visit Cisternino and renew our acquaintances with neighbours and townsfolk, who always seem pleased to see us and invite us into their lives. We love to escape the hustle and bustle of our lives in England and enjoy the better experiences which life has to offer in Puglia. We hope that all our guests will enjoy this little haven of tranquility in a busy world and feel relaxed and replenished when they return home. We bought Trullo Stefano because we love Italy and the Italians and especially the beautiful town of Cisternino and its friendly inhabitants. The area has a charm and magic of its own, unspoilt with the passage of time and this is reflected in the people who are friendly, helpful and generous of spirit. The trullo has its own magic and charm and is just a really lovely experience for the first time and always. It seems to carry you back to an earlier age, when life was more simple and pleasurable. The trulli nestle and blend into the landscape as though they have been there since ancient times. They are especially wonderful in the early morning sun and in the evening time. Nature is all around and the each season has its own colours and beauty. There are many benefits of staying in Trullo Stefano, the privacy, being able to wonder on the land and help yourself to any fruit or produce which is in season. The trullo stays cool in the summer and warm in the winter. Enjoying a barbecue on a warm summers evening or snuggling down in the trullo with the log stove burning, reading a good book. The views of Cisternino are also spectacular. Our Italian geometer always loved the views from here, which even he as a local, said were wonderful and some of the best he had ever enjoyed. Main bathroom with shower, toilet, sink and bidet. Also incorporates washing machine. En-suite bathroom to bedroom 3 with shower, toilet and sink. Notes on accommodation: Recently restored to a very high standard. Accommodation cool during the Summer months. Does not require air-conditioning. Suitable for children and elderly people. Outside: Large patio areas overlooking olive groves with pergola housing built in barbecue. Dining table to seat at least 6. 6 sun loungers. Washing line. Large private driveway accessed by lockable gates. Variety of fruit trees including olive, fig, madarin, walnut and lemon. Cleaning / Towels / Linen / Maid service: Property cleaned weekly. Linen and towels provided. Also beach towels provided. Changed weekly. A quiet peaceful location with good views from the pati. Property very well equipped. A spacious well equipped property in a very peaceful location a couple of miles away from the town of Cisternino. Great country views from the patio and up on the roof to Cisternino and Locorotondo. Angelo who met us in the town to take us to the property was very helpful. Ideally situated to visit Locorotondo, Alberobello, Martina Franca, Monopoli and Ostuni. A great base to come back to in the evening. Thank you for your review. We are pleased that you enjoyed your stay in Trullo Stefano. We are very lucky to have Angelo working with us as he has a great passion for Cisternino and the surrounding towns. We hope that you will return to Trullo Stefano sometime in the future. We visited many of the amazing hilltop towns in Puglia but were happy to have chosen the delightful Cisternino as our base. It had everything we needed: good food (the local supermarket was extremely well stocked), loads of character, peace and beautiful views. The trullo was clean, comfortable and well-equipped and we loved eating out on the terrace, scrumping the grapes, prickly pears, walnuts and figs on the property. We would certainly recommend it and would stay again. We are pleased that you enjoyed your stay in Trullo Stefano and thank you for your review. We hope you visit again. Beautiful trullo in peaceful location. 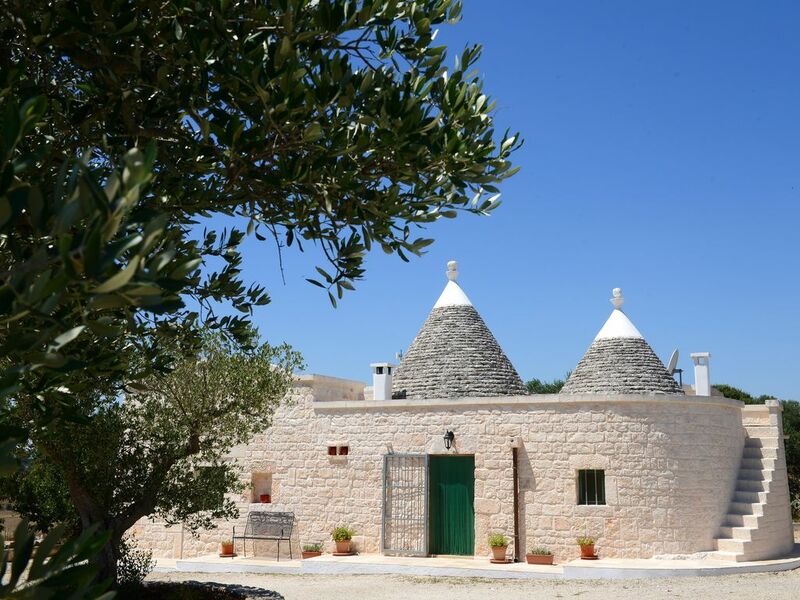 Trullo Stefano is an ideal holiday home: clean, comfortable, well furnished and extremely well equipped. The location is ideal for exploring this fascinating area, and the house is a welcoming place to come back to and relax in after the day's excursions. I would definitely recommend it to others. The small, well-stocked supermarket is a short drive away, and there are good restaurants in the town. One suggestion would be to have some printed information such as location and phone number of the nearest hospital and doctor, for any possible emergency. Thank you for your review, we are so pleased you enjoyed your stay in Trullo Stefano. Thank you also for your comments about contact numbers, which we will act upon for future guests. Kind regards Stephen and Kate. È vero che il parere può essere soggettivo, ma per quanto mi riguarda io non ho nulla da lamentare. Il trullo è pulito, immerso nella natura, curato nell’arredamento e soprattutto non manca nulla. Inoltre chi si occupa dell’accoglienza è disponibilissimo. Thank you for being our guest at Trullo Stefano and that you have enjoyed your stay. We hope that you can visit us again in the future and enjoy the good life that Cisternino and the Itria Valley in Puglia has to offer. Arredato con gusto e ben equipaggiato, ha grandi e bellissimi spazi attrezzati all'esterno. Lo consigliamo vivamente! Very well équipt country trullo outside cisternino. We have 2 very small children, and this was a very good place for them. We took carrots for the horses and donkey next door, ate grapes directly from the vine and went to the baby park and had breakfast in cisternino (bar fod) almost every day. It's a 15/20 minute drive to the beach (Adriatic) at Lido bizzaro or the other ones dotting the coastline. We know Puglia and prefer the beaches on the ionico (west) but the drive was too far with little kids. 15 mins travel time by car to miles of unspoilt beaches, many including restaurants and bars. Sunbeds and parasols can be hired at reasonable cost. Bari airport 1 hour by car. Brindisi airport 40 mins by car. Hire car is essential. Pre-booking recommended. Ryan air fly to Bari and Brindisi from Stansted alternate days. British airways fly from Gatwick to Bari on Thursdays and Saturdays during the season. Approximate flight time is 2.5 hours. 14km to Martina Franca. 5km to Cisternino. 17km to Ostuni. Cisternino has many excellent restaurants and bars. Supermarkets local shops and banks. Weekly outdoor market normally on Mondays selling local produce. There are numerous festivals and outside performances in the historic centre. The most famous tourist attraction is the beautiful town of Alberobello known as the 'town of the trulli' which is well worth a visit. There is a swimming pool 15 minutes drive from Trullo Stefano called Residenza Aurora www.residenzaurora.com cost 5 euros per person per day. You will need a bathing cap unless like me you have no hair. You can buy one from them at a cost of 2 euros or take your own. Booking Notes: Email or telephone bookings available. A non refundable deposit of 25% of the full price is required upon initial booking. Balance payable prior to 6 weeks before the start of your holiday. Gas central heating is available if requested in colder months at £20 per day payable in advance 6 weeks prior to booking but refunded if unused. Changeover Day: Flexible, but please vacate by 9am.